This week The Nun, the latest entry in the Conjuring series of films will begin haunting theaters. 2017’s Annabelle: Creation was a solid frightfest; and I had excitedly settled in to watch The Nun hoping it would have been cut from a similar cloth. When you’re coming into the fifth film in a horror franchise, one would hope that the tone of the series might have been settled on. Ninety minutes later, I was just glad it was over. The film centers on the discovery of a young nun at a cloistered abbey who has taken her own life. The Vatican dispatches a “miracle hunter” priest (played by Demián Bichir) and a novitiate (played by Taissa Farmiga) who is on the threshold of her final vows to investigate. 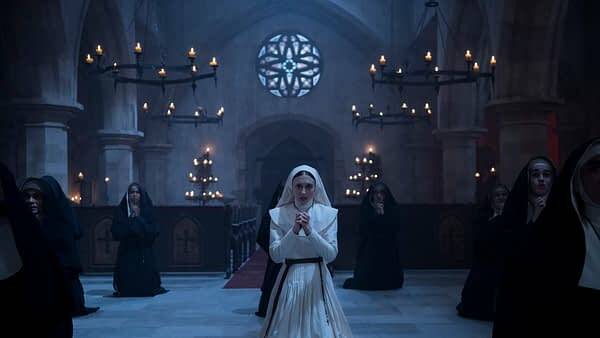 Together, they uncover the order’s unholy secret and confront the malevolent force which appears in the form of the same demonic nun from The Conjuring 2. I’m a huge horror fan, and appreciate the gamut of approaches, ranging from gore-fests to comedic, from thriller to horror, from monsters to ghosts. The Nun’s production quality is superb, including shooting at the 15th century Corvin Castle, located in Transylvania-Romania. But good costumes, setting, and Maxime Alexandre as cinematographer can’t begin to save a truly horrid script by Gary Dauberman and James Wan. Between Dauberman, who wrote Annabelle: Creation and Wan who was the writer of the Saw franchise of films, we would have expected for another jump-scare and horror-filled film. The Nun suffers from having no coherent tone; at one moment the audience is dreading a ghost jumping out, but at another the dialogue or character actions are either comedic or simply silly. When the audience is laughing at the characters rather than with them there’s a problem. With the divergent tone, it’s impossible to have a clear read if the writer is intending the character to come across as ridiculous or if it was just poorly conceived. Because of the high quality of the production as a whole, the missteps just come across all the more glaring. There’s a pair of legitimate jump-scares that stem primarily from misdirection, but since we already know from earlier films (and every trailer and poster) what the evil entity looks like (the demonic nun), there’s not even much horror (perhaps a bit suspenseful for the faint of hearted, but for the likely first weekend watchers, it’ll seem very milktoast). After the solidly good entry that was Annabelle: Creation (remember how much dread and suspense was built up just by keeping the camera on an inanimate scarecrow), the Nun is unfortunately just not worth it. Wait a few months and perhaps it’ll be something to watch as part of a Halloween midnight marathon – or if you have someone that you are wanting to ease into horror as a genre. It’s almost enough to cause us to break the habit of looking forward to Creation films. Habit, get it? Like a nun’s habit? That bad pun is still better than The Nun, which opens in theaters on Friday September 7th 2018. The Terrifics #7 Review: How Many Layers of Nostalgia Are We Working With?